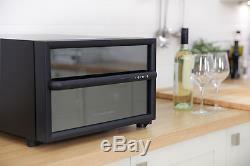 Wine Bottle Cooler Drinks Chiller Counter Top Mini Bar Fridge Refrigerator Party. With a modern black horizontal design, this 8 bottle drinks cooler from Russell Hobbs is as eye catching as it is practical. The RH8WC1 has an easy to read LED display and a temperature range between 8 and 18 degrees. The glass door and internal light allow you to view your chilled drinks without having to open the door. Storing your bottles in the cooler helps to free up space in your main refrigerator, and keeping them all together makes it easier to locate your favourite. The contoured shelves prevent bottles from rolling around, which is often a problem when storing bottles in a glass-shelved refrigerator. This Russell Hobbs bottle drinks cooler stores and cools up to 8 x 75cl bottles, whilst creating extra space in your main refrigerator. The sculpted shelves hold the bottles in place whilst ensuring they are organised and easy to access. The internal light illuminates your drinks selection and the button controlled temperature is displayed on the easy to read LED display and has a range between 8 and 18 degrees. The unit also has adjustable feet for making sure the cooler is stable. This stylish horizontal 8 75cl bottle drinks cooler will look great in any kitchen, as well as being practical and functional by saving you space in your main fridge. Standing 27.5cm tall, and measuring 41cm wide by 54.3cm deep, the cooler is compact enough to be housed comfortably in most kitchens. 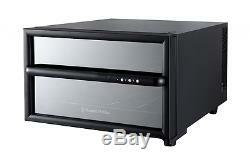 1 x Russell Hobbs RH8WC1 Bottle and Drinks Cooler 1 x Instruction Booklet 3 x Removable Wire Racks. 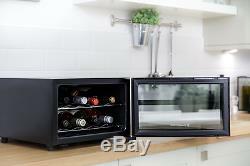 The item "Mini Bar Wine Bottle Drinks Chiller and Cooler- Counter Table Top Fridge Party" is in sale since Friday, June 2, 2017. This item is in the category "Home, Furniture & DIY\Cookware, Dining & Bar\Bar & Wine Accessories\Ice Buckets & Wine Coolers". The seller is "easy-home-bargains" and is located in GB.